View our diamond earrings here. The gift of diamond earrings is one that will never go out of style. There is no better gift for anyone than a magnificent pair of diamond earrings. Most diamond earrings can be worn with anything and they are versatile and fabulous to look at. One of the reasons that diamond earrings are such a popular gift choice is that they can be given to women and girls of all ages. There is no better or more versatile diamond earring than the ever popular diamond stud earrings. These little gems are one of the few things that can truly be worn by anyone no matter how old or young you happen to be. These earrings make the perfect gift. Diamond earrings make great birthday gifts for women and girls. What girl would not be thrilled at receiving a gorgeous set of diamond stud earrings? There are many different kinds of diamond earrings based on the types of metal and the style used. 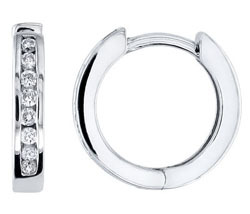 You can get silver earrings, white gold earrings, yellow gold earrings or even platinum earrings. The choices do not stop there. You can choose different shapes of diamonds as well. There is the princess cut stone which has a square shape or you can choose the pear-shaped, the heart-shaped, the rectangular-shaped emerald cut and the classic brilliant cut which is round and extra sparkly. Diamonds are the most popular and sought after stone of all. For those of you who are willing to spend the extra money, diamond earrings with other stones set in them will definitely turn some heads. You can get some beautiful diamond earrings that not only have perfect, flawless diamonds but also many other precious gemstones such as rubies, emeralds or sapphires. Tourmaline and topaz are also popular stones. The diamond earrings that are right for you all depend on your personal sense of style.